CHICAGO – I’ve said for two seasons now that Showtime’s “United States of Tara” isn’t as good as it should be, partially because the writing and parts of the ensemble don’t live up to the Emmy-winning work by its stunningly talented star, Toni Collette, but I might have been wrong. The start of season three, debuting tonight, Mar. 28th, 2011 on Showtime, hints at a broader program with a deeper ensemble, but I’m not sure any more that this is a good thing. The supporting cast of the current season of “United States of Tara” features a few incredibly talented actors including Rosemarie Dewitt, Keir Gilchrist, Patton Oswalt, and the new addition of the great Eddie Izzard. And yet I can honestly say that I still lose a bit of interest every time the plot turns away from its multi-talented, multi-personality lead. Tara Gregson, a woman with multiple personalities, has become such an interesting character and the performance by Collette has become so compelling that attempts to expand the series beyond her fail to match her work. At the beginning of season three of “United States of Tara,” the Gregson family seems pretty much in order. The kids, Kate (Brie Larson) and Marshall (Keir Gilchrist), are still trying to find their identities but that’s normal at their age and Max (John Corbett) is dealing with the struggling economy while Tara’s sister Charmaine (Rosemarie Dewitt) awaits the impending arrival of her first child. It almost seems like everyone but Tara has something to worry about. That is until she decides to finish something she never got a chance to and goes back to school. 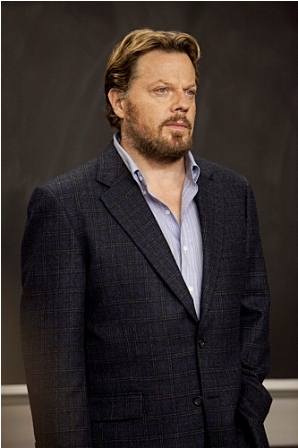 It’s there that Tara encounters an abrasive teacher played by the great Eddie Izzard. You see, Tara didn’t finish school because she tried to kill herself when her multiple personalities took over due to the stress. Naturally, Max is worried this could happen again, and probably would be even more concerned if he knew that Tara’s teacher doesn’t even believe in her disease, thinking that Dissociative Identity Disorder is an over-used diagnosis. Will Tara struggle to graduate yet again? A surprising amount of the first few episodes of the new season of “United States of Tara” allows actors and actresses other than Collette to shine. We spend a lot of time with Neil (the great Patton Oswalt) and the needy Charmaine and Izzard steals many of his scenes, but the best moments in the series are still almost entirely due to Toni Collette’s performance. She’s so good that any attempt to steal her spotlight just doesn’t work. And I’m not sure it should. I almost feel like it would be better to just give in and recognize that this is Tara’s show in the same way that “Dexter” and “The Sopranos” belong to the leads who share a name with the series. I also feel like the writing on “United States of Tara” often feels like it’s trying too hard to be quirky and different, particularly in minor roles like Michael Hitchcock’s overdone character and most of the activity of Brie Larson’s undefined daughter. The writing bounces back and forth between the believable and the “quirk for the sake of quirk” that sinks a show like “Tara.” Collette takes what could have been a gimmicky role and does such a good job with it that it makes all other flaws of the program fade away. It’s one of the best performances on television, even if the show it’s on doesn’t always live up to it. Collette (and, to be fair, Gilchrist, who’s quite good) bring the comedy back to Earth every time it threatens to float off completely into the kind of eccentricity you only see on television, but it still threatens too often to be considered a great show. Having said that, I have to say that I’m more interested to see how the rest of this season plays out than I was for the first two. Perhaps it’s because of my adoration for the underrated Izzard or the fact that I’m always curious when a show shakes up its formula a bit. I’m just not sure yet if the suggestion to shake up “United States of Tara” was right in the first place. “United States of Tara” returns on Showtime on Monday, March 28th, 2011 at 9:30pm CST. It stars Toni Collette, John Corbett, Keir Gilchrist, Brie Larson, Patton Oswalt, Eddie Izzard, and Rosemarie Dewitt. It was created by Diablo Cody and is executive produced by Steven Spielberg.